The Bermuda Monetary Authority today [Feb 13] confirmed Bermuda had 776 active captive licences on its register as at 31st December 2016. The Authority’s definition of a captive [i.e., an insurer predominantly formed to self-insure the parent company] includes: Class 1, 2, 3 general business insurers and Class A and B Long-Term [life] insurers. 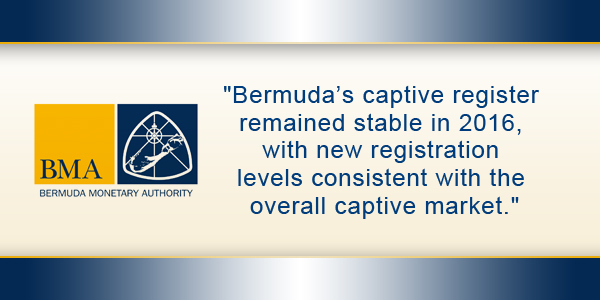 “Bermuda’s captive register remained stable in 2016, with new registration levels consistent with the overall captive market,” the BMA said. Craig Swan, Managing Director, Supervision said “The Authority continues to ensure that Bermuda’s captive sector – which has made significant contributions to Bermuda’s economy for well over 50 years – remains appropriately regulated.